Lemongrass Soup by Chef Souvir Saran, from Indian Home Cooking by Suvir Saran and Stephanie Lyness. You don’t have to serve traditional bowls of soup: think about different vessels for your soups, like these tall shot glasses. Sometimes we come across soups better than we can make ourselves; or consommés and stocks that make making our own not worth the trouble. Use the Contact Us form on this page to recommend outstanding specialty soups. e.g. vegetable broth for chicken broth or soymilk for milk. Take a tip from Rick Tramonto of Chicago’s restaurant Tru. 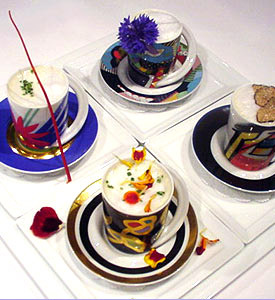 He serves a soup course “tasting plate” of four different soups in demitasse cups. (These look like cappuccino because he foams the tops.) For winter, think mushroom, root vegetable, seafood bisque, and perhaps a coconut-milk based spicy Thai soup. For summer, serve a medley of cold soups: cucumber dill, gazpacho, borscht, and fruit soup. Do you have to make the soups yourself? 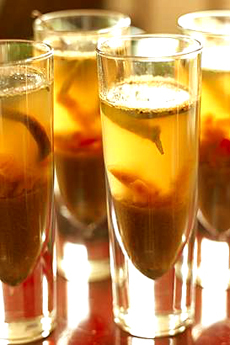 No—there are so many great take-out soups, just adjust the seasonings and select great garnishes. Chef Rick Tramonto suggests a better use for those demitasse cups!